Get the Funk Out! : Ellen Hopkins, the #1 New York Times bestselling author of eleven young adult novels, as well as the adult novels Triangles, Collateral, and Love Lies Beneath, joins host Janeane Bernstein Monday March 20 at 9:00am pst! Ellen Hopkins, the #1 New York Times bestselling author of eleven young adult novels, as well as the adult novels Triangles, Collateral, and Love Lies Beneath, joins host Janeane Bernstein Monday March 20 at 9:00am pst! Did you miss Ellen Hopkins on today's show? Ellen Hopkins—who has been called “the bestselling living poet in the country” by mediabistro.com—has over four million books in print, many reaching #1 on the New York Times bestseller list. Her latest book, The You I've Never Known, is out now and host Janeane Bernstein will be sharing details on this latest work! For the first time in both verse and prose, Ellen delivers a “deeply personal” (Publishers Weekly) novel where a teenager discovers uncovers a startling truth: her mother didn’t abandon her. Her father kidnapped her. In the vein of NBC’s This is Us, we follow the story of a teen mother (Maya) and daughter (Ariel) looking for the missing pieces in their lives. The real twist? The author has experienced a kidnapping like this first hand! The book is not just a thriller, but also tackles issues of love and sexual identity, in an emotionally deep way. As Ariel navigates through high school, she explores her sexual identity and develops relationships with both a male and female character. Ellen Hopkins has been writing for Young Adults for 13 years, and is one of the first YA authors to continuously tackle tough issues successfully. She feels it is important to reach the teen readers that demand a story that’s deeper than just fluff, something that they can hold onto and that helps them understand that they are not alone in the world. 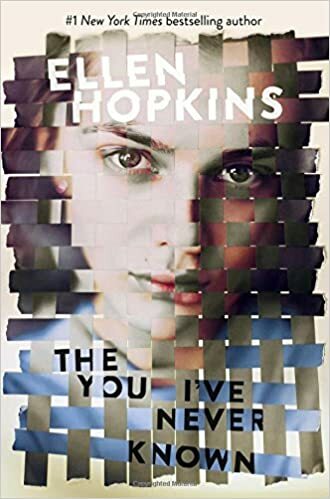 Ellen Hopkins is the #1 New York Times bestselling author of eleven young adult novels, as well as the adult novels Triangles, Collateral, and Love Lies Beneath. She lives with her family in Carson City, Nevada, where she has founded Ventana Sierra, a nonprofit youth housing and resource initiative. Visit her at EllenHopkins.com and on Facebook, and follow her on Twitter at @EllenHopkinsLit. I was adopted at birth and raised by a great, loving older couple. I grew up in Palm Springs CA, although we summered in Napa and Lake Tahoe, to avoid those 120 degree summers. After my adopted parents died, I did find my birth mother, who lives in Michigan with my half sister. I studied journalism in college, but left school to marry, raise kids and start my own business--a video store, before the mega-chains were out there. After a divorce, I met my current husband and we moved to Tahoe to become ski bums and otherwise try to find our dreams. At that time, I went to work for a small alternative press, writing stories and eventually editing. When we moved down the mountain to the Reno area, I started writing nonfiction books, many of which you can see here. The rest are viewable on my personal website. I also continued to freelance articles for newspapers and magazines. All that has changed, with the publication of my novel, CRANK, which has led to a valued career writing YA novels in verse, all of which explore the more difficult situations young adults often find themselves in. Will I ever write one in prose? No doubt! But, for the moment, writing novels in verse fulfills two needs: writing poetry and writing fiction. The combination is so interesting! WANT SOME TIPS ON WRITING?